Amber jewelry is a special favorite. It comes in various qualities (polished or rough) and colors (from almost white to dark brown, but most commonly it’s honey-colored). Amberison, an online jewelry shop, proved some ideas about how to tell the difference between genuine and artificial (plastic). In the Art Nouveau district, check out Ambra at 7 Alberta iela. Linen from Latvian flax has been produced for centuries. It is much cheaper here than elsewhere in Europe. Shops carry tablecloths, placemats, napkins, pillow covers, bed linen, women’s clothing, and more. Wooden objects and toys – Local craftsmen turn out all sorts of appealing items. Leather goods – Wallets, address books, boxes, book cover, etc. Colorful knitted items – Sweaters, mittens, gloves, hats, headbands. Art Nouveau souvenirs – Silk scarves, ceramics, books, copies of some of the faces on the building façades (see earlier posting about Art Nouveau buildings). 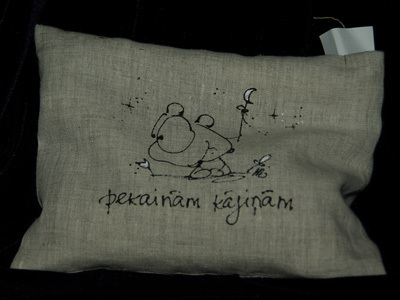 A shop at 9 Strēlnieku specializes in these souvenirs. Riga Black Balsam – Since the late 18th century, this dark beverage has been considered an elixir by the Latvians. It’s made from a secret recipe and contains 24 different infusions of roots, foliage, blossoms, and buds. Silver jewelry – Some really nicely designed rings, necklaces, and bracelets—both Latvian folk designs and modern—are available in many shops. Collectibles – Antique shops carry icons, coins, books and Soviet memorabilia, such as military medals and busts of Lenin. Christmas tree ornaments – Riga claims to have had the very first Christmas tree (eglitis) in 1510. A number of craftspeople make charming little tree ornaments from natural materials (such as acorns, birch bark, and reeds).